For allergens, see ingredients in bold. Also, may contain gluten, egg, peanuts and products thereof. Caramel Nut Flavour: Protein Blend (34%) (Milk Protein, Hydrolysed Gelatine), Milk Chocolate Couverture (17%) (Sugar, Cocoa Butter, Whole Milk Powder, Cocoa Mass, Emulsifier (SOJA Lecithin), Flavouring), Caramel (14%) (Sweetened Condensed Milk, Glucose Syrup, Non-Hydrogenated Vegetable Oil (Palm, Rapeseed), Sugar, Caramelised Syrup, Emulsifier (E471), Salt, Flavouring), Humectant (Glycerol), Glucose Syrup, Peanuts (6%), Peanut Flour, Fructose, Rapeseed Oil, Flavouring, Sodium Chloride, Antioxidant (Mixed Tocopherols). Cookies & Cream Flavour: Protein Blend (39%) (Milk Protein, Hydrolysed Gelatine), Milk Chocolate Couverture (14%) (Sugar, Cocoa Butter, Whole Milk Powder, Cocoa Mass, Emulsifier (SOJA Lecithin), Flavouring), Fudge Style Icing (12%) (Sugar, Non-Hydrogenated Vegetable Oil (Palm, Palm Kernel, Coconut), Glucose Syrup, Water, Skimmed Milk Powder, Salt, Emulsifier (E472c), Preservative (E202), Stabiliser (E401), Flavouring), Glucose Syrup, Humectant (Glycerol), Cookie Biscuit Crumb (Wheat Flour, Sugar, All-Vegetable Shortening (Palm, Rapeseed), Fat-Reduced Cocoa Powder, Salt, Raising Agent (Sodium Bicarbonate)), Fructose, Flavourings, Rapeseed Oil, Antioxidant (Mixed Tocopherols). Maple & Pecan Flavour: Protein Blend (37%) (Milk Protein, Hydrolysed Gelatine), Milk Chocolate Couverture (15%) (Sugar, Cocoa Butter, Whole Milk Powder, Cocoa Mass, Emulsifier (SOJA Lecithin), Flavouring), Caramel (12%) (Sweetened Condensed Milk, Glucose Syrup, Non-Hydrogenated Vegetable Oil (Palm, Rapeseed), Sugar, Caramelised Syrup, Emulsifier (E471), Salt, Flavouring), Glucose Syrup, Humectant (Glycerol), SOJA Nuts, Nibbed Pecan Nuts (4%), Fructose, Rapeseed Oil, Flavouring, Caramelised Sugar Syrup, Antioxidant (Mixed Tocopherols). Protein Chox are nutritious protein bars designed for those looking to increase their daily protein intake through a delicious and convenient snack. These come in a number of unique flavours which have been made to imitate a range of great tasting snacks but with an improved nutritional profile. Each 60g bar provides up to 22g of premium protein with only 22g of carbohydrates (nutritional content will vary on flavour). 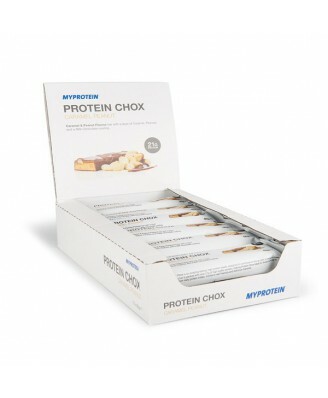 Who are Protein Chox Suitable for? 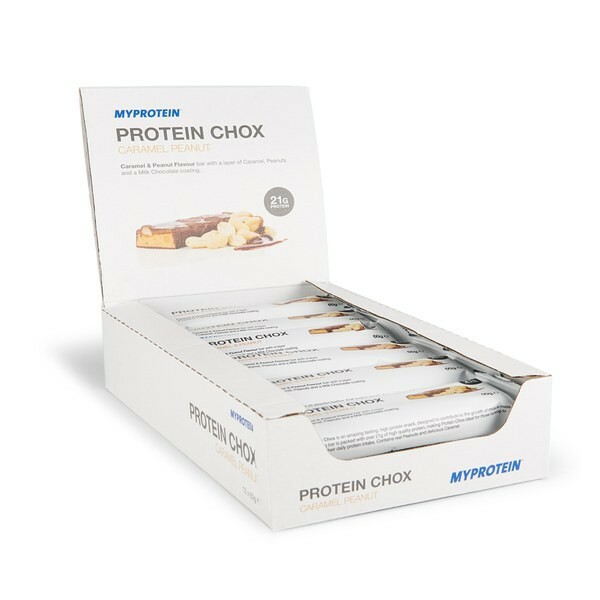 Protein Chox are an excellent snack for anyone looking to increase daily protein intake or looking for a source of protein before or after a training session. These can be used as an alternative for other protein based foods.